Though there is no such thing as a "safe" sport some sports make a person more prone to injury. Highly competitive sports, such as football, weightlifting, gymnastics, and wrestling can pose particularly increase rates of problems, especially among children. Its important to know the risks and how to prevent injuries from ever happening in the first place. Please read through the information below to learn more about what to look out for and what you can do to stay on top of your game. 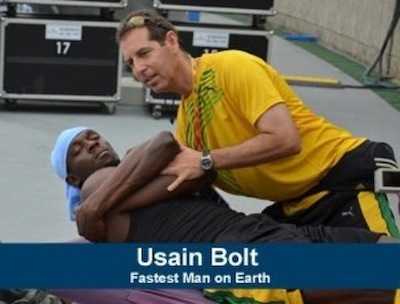 According to experts, as much as 20 percent of all sports-related injuries involve the lower back or neck. Running, weightlifting, and other sports, that involve repetitive impact, expose children to a high risk for lumbar spine (lower back) injuries. Contact sports, such as soccer, boxing/martial arts, and football are usually linked with higher risk of cervical spine (neck) injuries. More than one-third of all high school football players sustain some type of injury during play. Soccer players are easy candidates for mild to severe head traumas, neck injuries, cervical spine damage, headache, neck pain, dizziness, irritability, and insomnia. Heading the ball, the act of using the head to re-direct the soccer ball, has been linked with cervical injuries in children and adults. The trampoline and gymnastics also present significant risks for spinal cord injuries from unexpected and brute falls or contact with hard surfaces. Its important to stay aware of the risk and pay attention when participating in sports. Its important to not only keep sharp, but train and get treated to strengthen your body to prevent injuries from occuring in the first place. 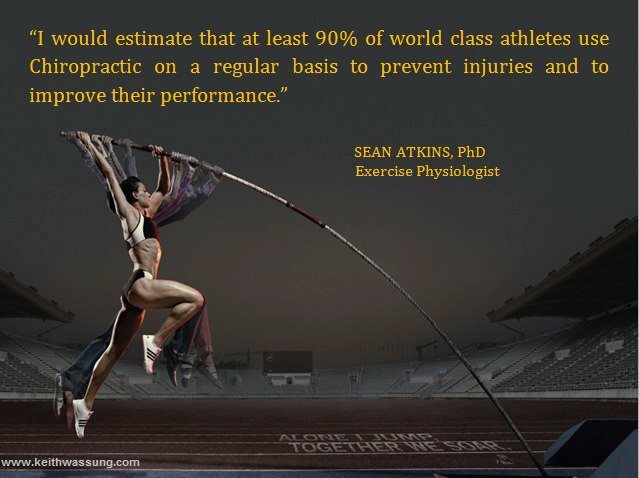 Often the most important factor when it comes to competing in sports is not injury prevention, but optimal preformance. It is common to have a muscle imbalance around a joint, which can result in instability and injury. These muscle imbalances can be completely symptom free, or a present as just a mild, nagging pain during or after a particular activity. You may say, "well I work out at the gym and strengthen the muscles around my joints, so that prevents injury." While this is true, it is important to train and strengthen muscles, but have you ever seen that professional athlete who is just running down field or getting a rebound and suddenly sprains his ankle or knee? Even though he is a highly trained athlete and works out 4-5 days a week a simple rebound or spin move has caused severe damage, how can this be? That injury is a result of a functional muscle imbalance that had gone untreated. Please refer to our Back Pain and/or Back Injuries pages for more information about specfics of muscle imbalance and its relation to injury prevention and mechanism of injury. The best way to keep preforming your best is to get all muscle systems in upper and lower regions of the body balanced before engaging in competitive sports. By fixing these imbalances and restoring proper neurologic input to the brain from your muscles you can possibly see increase sport preformance. Better connection between the mind and the body could produce increase reaction times or overall intensity or endurance. 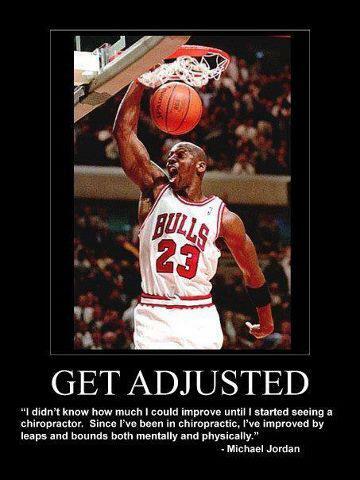 New research from New Zealand School of Chiropractic is showing a 6.8 % increase in reaction time in people that receive chiropractic adjustments compared to those who just rested. Also a very obvioius benefit to having properly balanced biomechanical and muscular system is being able to put more force through joints, which translate into generating more power. When your muscle systems are properly balancing a joint receptors in the tissues will allow more stress to pass through without causing systems to shut down. This prevents muscle joint/muscle failure induced injuries and also means more power equals better preformance! Football - High impact to any part of the body puts you at risk for injury. One of the most serious types of trauma is that which occurs to the head. These impacts can really jar your brain and spinal cord, which can result in problems with balance, muscular injury, concussions, headaches, and many other problems. Also a lot of the professional athletes have long term psychological problems when they get older from constant head trauma. The skull and face have a number of points that are called Crainial Stress Receptors, which can effect muscles anywhere in the body depending on the area of trauma to the head. A simple blow to the head or face, even if you feel ok, can cause a neurologic circut to shut off in a various part of the body, which can throw off biomechanics and thus impede your preformance. If you have questions about crainial stress receptors or want to learn more please Contact Us or setup a consult with a doctor. Balancing the muscles of the neck and upper back as well as keeping the spine in top shape is the best way to prevent serious injury from happening. Basketball - The dangers in this sport come from twisting and pivoting quickly, which puts lots of stress on the knees, hips and ankles. If a joint is not properly stablized by its muscle system it puts you at risk of stressing ligaments or other vital tissues in these areas. This often presents as a torn ACL or meniscus in the knee or an ankle sprain. Also the force of jumping up and landing on your feet can put quite a shock through your spine up to several times your body weight. Keeping a balanced core and having proper shock absorbing mechanisms of the feet, knees, and hips from extremitity adjustments will help reduce stress on the spine. Golf – Common injuries incurred during the sport of golf usually involve muscle sprains and strains to the lower back. People often have imbalance in muscle formation in the back, arms, and legs due to the repetitive nature of the sport and the unilateral or one sided working of muscles that results from the golf swing. Having core support and proper warm up is key to not straining your muscles or spine. It is important to address biomechanics as well as all the muscles involved in your swing to make sure you are properly balanced and that you are getting all the power you should from your swing. Getting proper hip rotation and wrist turnover requires practice, but can't be done without proper function of the muscles involved. So if you have the swing and accuracy mastered, but are lacking on power there is more to be done then simply weight training. Running/jogging – Running and jogging puts a great deal of stress on your back and knees, and ankles. Constant pounding against a hard surface can jar, and possibly compress, structures such as vertebrae, joints, and discs. People often have muscle imbalance or foot subluxations that can cause pain up through the kinetic chain and involve the knees, hips, back, and even neck. The irregular gait that can result from compensation problems of the foot, ankle, knee or any part of normal gait can cause severe problems for athletes and can hinder preformance in competition. At Synergy Chiropractic we check muscle function of our patients in gait different functional positions and which helps specifically identify the cause of your problem. Boxing/Martial Arts - This type of activity has a very high risk for injuries both clinical and sub-clinical. There is high risk of injury to hands, feet, shins, and the face to name a few. 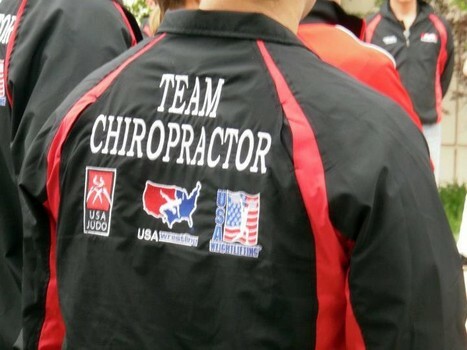 The nature of these sports is to cause trauma so if you participate in these types of events seeking chiropractic care is vital. That extra 15% in reaction time that can result from adjustmetns alone could make the difference between getting hit and making the hit yourself. Trauma to the body from punches or kicks often causes muscles to shut off in an attempt to not further injure the area. This will result in a muscle imbalance causing tight painful muscles and weaker inhibited muscles, which leads to biomechanical and fucnctional problems. Also a big area of trauma is the head and face, which happens to be full of stress receptors that effect muscles all over the body. As was mentioned in the football section, a fracture or bruise to a facial or skull bone that happens from a punch, even if you feel ok, can cause a circut to shut off in various parts of the body. If you have questions about crainial stress receptors or what to learn more please Contact Us or setup a consult with a doctor. Weight lifting/body building – Body builders are at a significant risk for a host of serious back, shoulder, neck, and knee injuries due to the compressive nature of the sport. Resistance training has been known to cause muscle sprains and strains, ligament and tendon injuries, and in some cases, stress fractures (also called spondylolysis) in the low back or shoulders. Older people that are weight training seem to be at higher risk since their bones and discs are more brittle, so it is important to consult with a doctor before beginning a strenuous weight lifting routine. The younger athletes who lift heavy weights are also at risk because their spine and cartilage in their joints is still very flexible and can become compressed or have stress fractures through growth plates, which results in serious life long consequences. It is important to have proper ligament and joint supplementation for this sport to help prevent injury. We recommend a variety of supplements that can help increase stability of joints and thus prevent injury and possibly even increase your max weight. Swimming – Swimmers are known to incur lower back injuries due to over extending their backs during turns or while swimming. Motions such as the crawl or breaststroke specifically cause the lumbar region to be hyperextended. 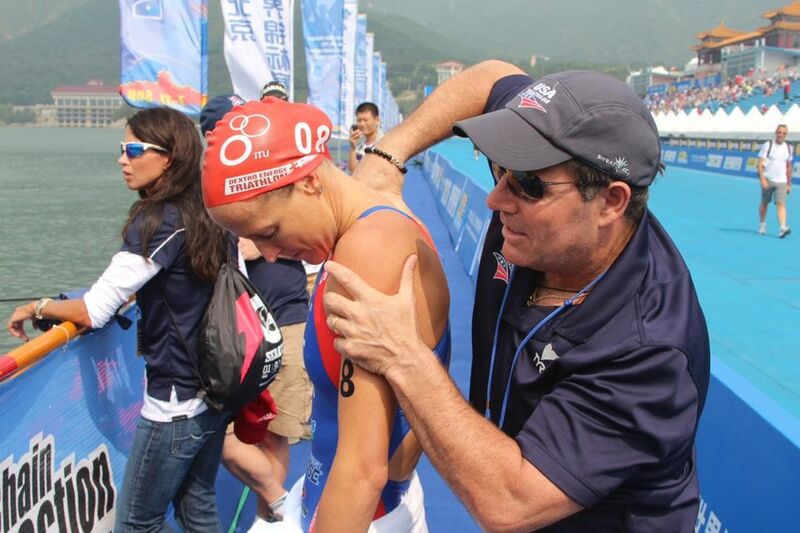 If the swimmer is not properly conditioned and has muscle imbalance, the hyperextension sometimes doesn't subside and you can have chronic low back pain. Also the muscles of the shoulder and scapular region must be balanced for optimal range of motion and strength. Myofacial therapy and chiropractic adjustments can greatly increase both factors and thereby possibly increase preformance in some cases. Tennis – "Tennis elbow" is a general term for pain on the lateral, or outside part of the elbow, on or near the bony protrusion of radius or lateral condyle. Tennis elbow is caused when the tendon of the wrist extensor muscles tears or is irritated due to muscle imbalance in the forearm. In addition, tennis players are in constant motion, and the repeated twisting and trunk rotations can cause injuries. Shoulder injuries and turned ankles and knees also are common. The act of serving the ball also has been shown to hyperextend the lower back, and possibly compress discs or cause spinal facet irritation. At Synergy Chiropractic we have good success with balancing muscles of the forearm and shoulder using muscle testing and neuromuscular reactivation. We can isolate the weak and tight muscles and balance the joint which can greatly reduce pain and improve active range of motion. Skiing – Skiing involves a great deal of twisting and turning motions, as well as jarring landings, all of which can cause muscle sprains and strains and in some cases, meniscal and ligament damage. Also if the abdominal "core" muscles are not neurologically intact you are more prone to injury due to decreased stability in the spine. Bicycling – Poor posture can greatly increase your risks of a back injury during cycling. When riding a bike, your lower back is constantly flexing sideways and up and down. Upper back injuries can result from flexing of the neck and being in a "hunched" position for an extended period of time. Also the bumps and jars incurred on the road during cycling can wreak havoc and possibly cause injuries to your spine or supportive muscles. 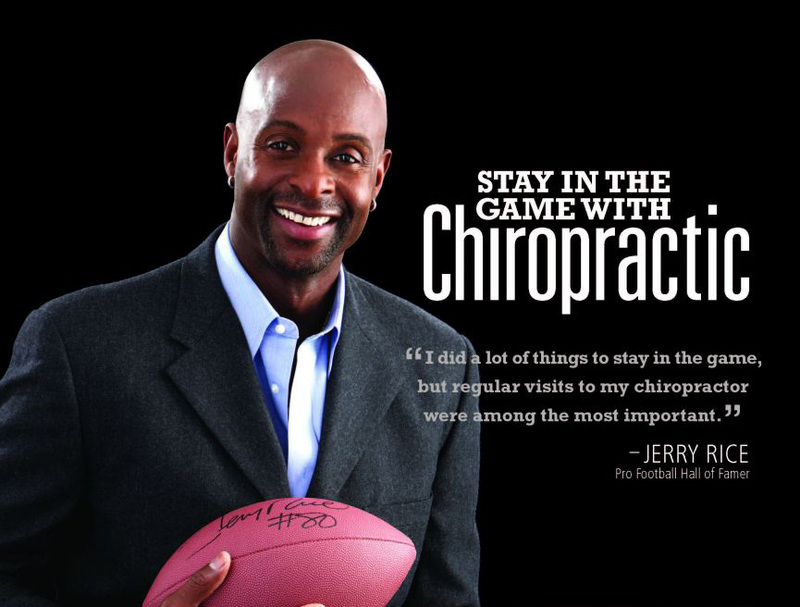 At Synergy Chiropractic we specialize in Applied Kinesiology where we use a variety of techniques that can rapidly and effectively heal and reduce pain from sports injuries. Often injuries cause damage to a muscle, which then neurologically shuts off and as a result the opposing muscle becomes too tight. Both the shut off muscle and the tight muscle can be painful and through proper neuromuscular techniques we can fix this imbalance and restablize your joints. Using manual muscle testing we identify what muscles aren't properly firing and we activate them via specific receptor stimulation done by hand. We also specialize in adjusting the extremities such as hands, feet, knees, elbows, hips, and shoulders, which can improve nerve function and refacilitate muscle activity around joings. We have been trained in numerous adjusting techniques for the extremities that most chiropractors and physical therapist have not seen and are not using. We also utilize dry needling techniques where we insert needles, like the ones used for acupuncture, into trigger points in mucles. This has a deep relaxing effect on tight knots of muscle which can sometimes not be fully treated by hand and it also speeds up healing to the area. The therapy we provide can get you out on the field quickly and feeling confident with the injured area, which is vital to regaining optimal preformance. At Synergy Chiropractic we also can give you ideas of what types of training excercises as well as rehabilitative work you can do to help your body increase stability, which can prevent injuries from occuring in the first place. If you are suffering from any of these issues or are an athlete looking to prevent injury or potentially improve muscle preformance then Contact Us and set up an appointment or a complementary consult. We offer a complementary 15-minute consult during which we can show you how it feels to be muscle tested as well as screen you for functional muscle pattern problems. 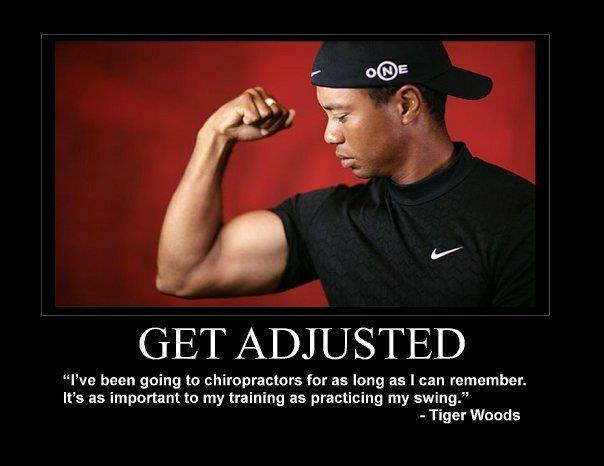 We would love to help you keep or regain your optimal preformance level and live/play to the fullest of your ability. 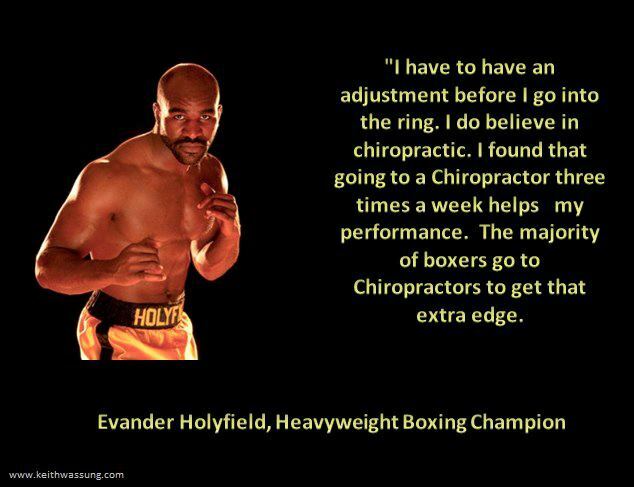 Large collection of chiropractic statistics and articles (Click Here). 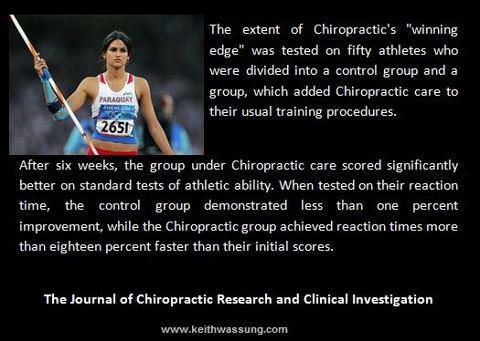 Specifically cited are articles titled: Reaction Time and Chiropractic Adjustments; Research Shows Spinal Dysfunction Affects Reaction Time and Preformance.